May 5 is my mother’s birthday — happy birthday, Rosemary Rosick Lipinski! — and when I think of my favorite things about her, I think about her lifelong sense of curiosity. It has been one of her best gifts she’s given me (besides the decades of devotion and financial and emotional support, and the Barbie townhouse with working elevator). I believe this because curiosity keeps us open to surprise, interested in others, compassionate and a dedicated life-long learner, and these are all good things for individuals and for the humankind. Her curiosity drives her to make friends wherever she goes — striking up conversations in waiting rooms, check-out lines and restaurants. She always gets to know her neighbors. While I spent my teen years rolling my eyes at how she would learn her seat mate’s life story before the end of every airplane flight, I now realize that it is that curiosity that keeps her connected and able to find humor and insight in every day activities. It was that curiosity that made her an avid reader and patron of libraries, enrolled her in college courses in her 30s, moved her to protest against the Black Fox Nuclear Power Plant in the 70s and 80s, got her elected to church council, turned her an expert caregiver when Dad was diagnosed with Parkinson’s Disease, and that encouraged her to figure out email in her 60s and Skype, Facebook and the iPad in her 70s. My mother has never been static; her interest in the details of life and people keep her spirit young. …One can remain alive long past the usual date of disintegration if one is unafraid of change, insatiable in intellectual curiosity, interested in big things and happy in small ways. Curiosity is a remarkably powerful characteristic, and I’m glad my mother is equipped with such a generous amount. Studies link curiosity to improved health, intelligence and relationships. It’s crucial in the pursuit of happiness. 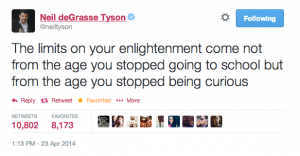 That’s because curiosity — a state of active interest or genuinely wanting to know more about something — creates an openness to new experiences, laying the groundwork for greater opportunities to uncover moments of wonder, joy and delight. Curiosity and seeking out new experiences helps lay down new neural pathways in our brain, and research is being done into the links between curiosity, neuroplasticity and resistance to dementia. Watching her exercise her curiosity in daily life taught me some life lessons as well. I know from her that the more inquiry and energy we invest in a topic or a person or a conversation, the more interesting they become. And that in turn leads to more opportunities to experience discovery or inspiration. Curiosity has also helped me as a creative writer, because it makes me more alert to the little details that can tell whole stories. Think of Sherlock Holmes solving a mystery by noticing that a dog did not bark at night, and wondering why. So, Mom, on your birthday, thank you for the gift of curiosity along with all the love. May we grow curiouser and curiouser with time. Nota bene: I love this photo of her because of her plucky pose and “Mom” tshirt. Doesn’t she look ready for anything? 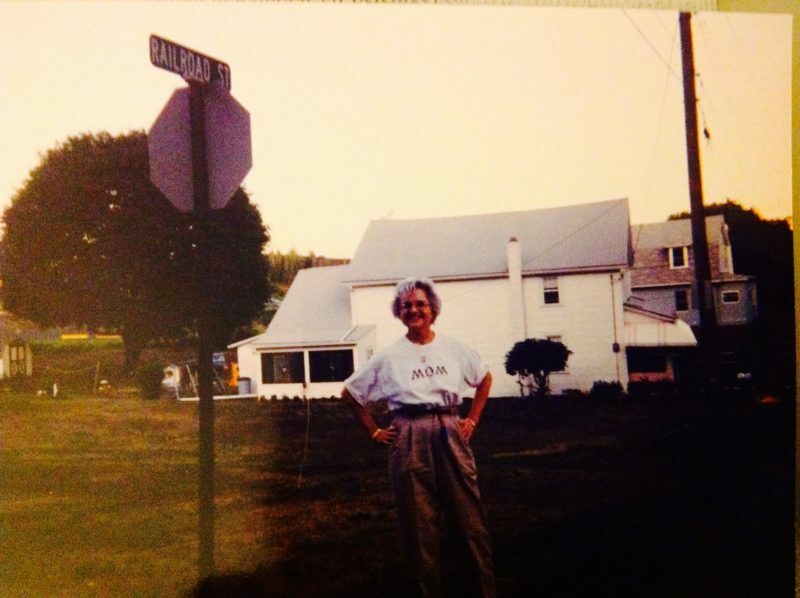 It was probably taken around 1999; she’s standing on a vacant lot on Railroad Street in Larksville, Pennsylvania, near where her childhood home used to be. A very nice insight into your wonderful mother. Happy Birthday Rosemary. Sweet story about a very sweet woman. Nicely done Lynn! What a sweet story about your Mom. She is a gift to all who know her and I’m privilege to call her my best Friend. Simply wonderful Lynn! I love that she was an avid reader and patron of libraries. The apple didn’t fall far from the tree. Your writing abilities alone are a wonderful tribute to your Mom.